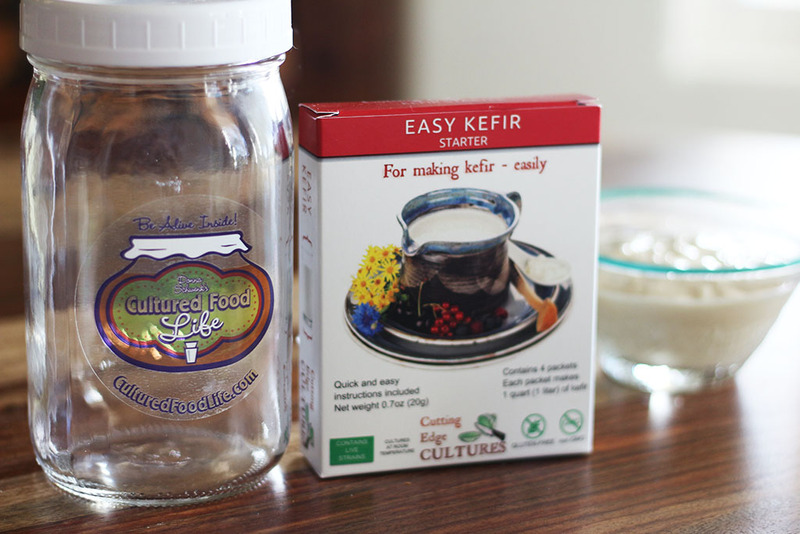 Wisdom KrautVideo: Is Your Kefir Separating? I had no idea just exactly what I was making when I created this recipe several years ago. I just thought the combination tasted good and seemed to give me spectacular results during cold and flu season, so I kept making them and giving them to my family. Fast forward a few years later and one of the greatest discoveries I have found lies in the jar. I have been learning a lot about the immune system and what is actually going on inside of us. Our guts comprise at least 80% of our immune system and if your gut is healthy, guess what? Your immune system is too! 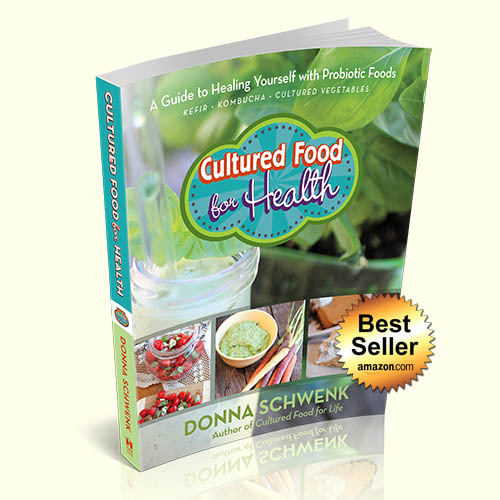 Probiotic cultured foods are an important key but so is something else. Prebiotics are my new frontier of discovery, and all the things I am learning are blowing my mind. All the forces in the world are not so powerful as wisdom that has been discovered by someone who needs it. What are prebiotics? A prebiotic is a specific category of foods that are food for bacteria. 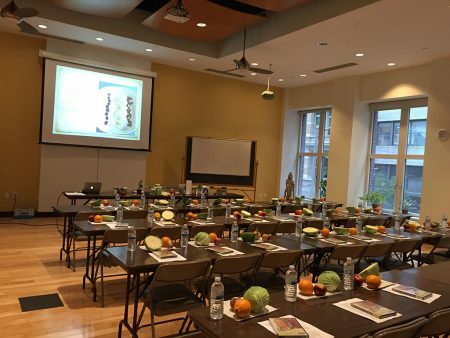 They abide in many fruits and vegetables and even the fermented peels of oranges and lemons will create prebiotics. A prebiotic is made from soluble fibers that have no calories and your body cannot digest these fibers, but your bacteria can. These non-digestible prebiotic fibers make your good bacteria grow like crazy! Remember when fiber was all the craze? I never understood this, but now I do. It was feeding your bacteria and allowing it to do its job. But here’s the kicker, if you don’t have a lot of good bacteria in your gut, prebiotics can make other bacteria that are not helpful grow too, and you don’t want that. You want lots of beneficial strains of good bacteria which you can get by eating cultured foods. I can’t stress enough to you how important this is. It’s changed so much in my life and body and I am pumped about it. The more good bacteria you have, the stronger and more powerful your immune system becomes. You can’t mess with large amounts of good bacteria; they want to dominate, control, and kill harmful pathogens to keep you healthy. They’re smart and want to hold the fort inside of you strong and keep enemies at bay. They strengthen the bowel wall, improving the body’s ability to absorb essential nutrients such as calcium and magnesium. They also produce hormones that control appetite, anxiety, and more. In a world where scary viruses are going crazy, you need cultured foods and prebiotics to keep you strong. Consuming prebiotics daily with cultured foods can change your gut bacteria in a day. Here are some of the prebiotics that help you grow a healthy gut: jicama, bananas, onions, garlic, chicory root, jerusalem artichokes, leeks, dandelion greens, asparagus. celery, the stalks of broccoli (not the florets), the peels of oranges and lemons that are fermented, red wine, honey, and some whole grains. I have some type of prebiotic every day now and what is so surprising is that this recipe has 4 prebiotics in it. 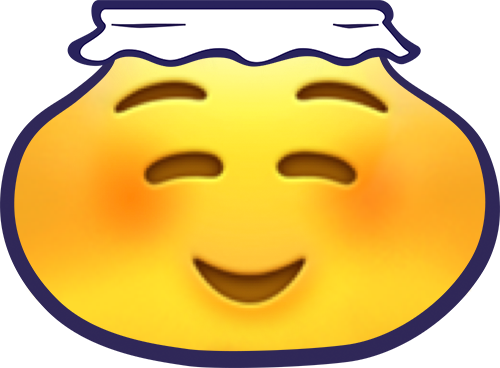 I had no idea when I was making this that it was doing more than just giving me probiotics. It was also feeding the bacteria as well. No wonder it’s so effective at keeping colds and flus at bay – it’s all the prebiotics in this recipe that make it super powerful! 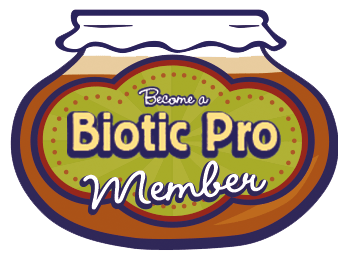 I am making all sorts of new recipes with tons of prebiotics and I sell a prebiotic too, in the product Prebio Plus. If you can’t eat these foods, you can add a scoop of the prebiotic Prebio Plus and it will make a world of difference. You will notice it after the first dose. Your stomach might start to gurgle and that’s the bacteria having a feast. You can put this prebiotic in hot or cold foods, so I add a little bit to my tea every morning and I also feed it to my kefir grains, and oh my, they love it. They will grow like crazy and it will also help you make your kefir creamy again after it has separated. Add a small amount of Prebio Plus, shake up the jar, put it in the refrigerator, and the next day your kefir is creamy again. Bacteria need food, too, and when you give them what they need, you will feel it in many ways. You’ll feel better, lighter, elimination will be easier and more frequent, and flus and colds will be a thing of the past. I’m devoting an entire chapter in my new book to prebiotics, and I can’t wait to share with you more of the things I have learned. They’re every bit as powerful as probiotics. It’s exciting stuff. I’m still growing and learning, and I love that I was already making recipes with prebiotics without realizing it. 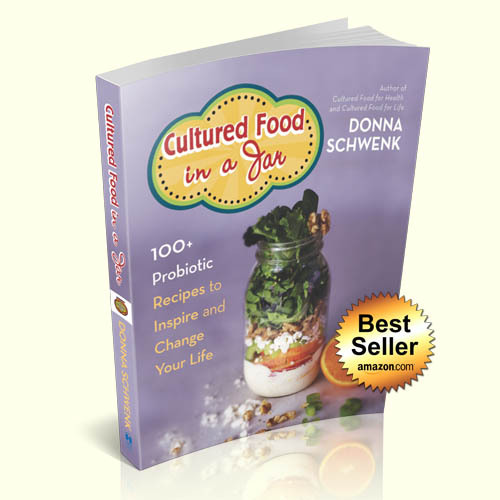 Eat your cultured foods and add prebiotics, too, and your gut bacteria can change overnight. This recipe has everything you need to accomplish the task. I just made a new jar myself! I really do love bacteria – somebody has to! They’ve taught me so many things and continue to do so. They’ve become my master teachers. 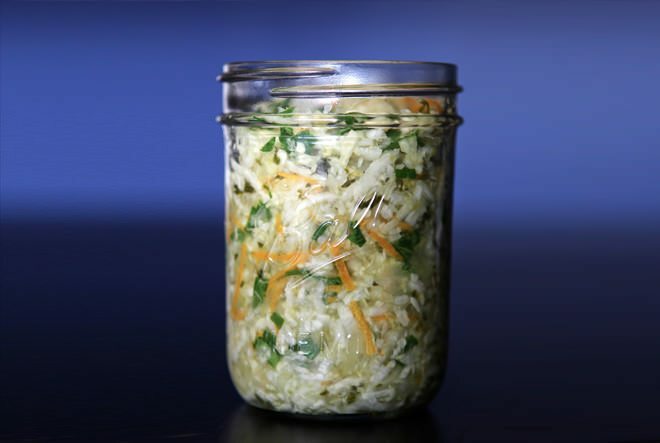 Finely shred the cabbage, jicama, apple, carrots spinach, and onion using a food processor or a hand shredder. Add to a large bowl. Add the garlic and salt to the bowl and toss to combine. Pack all ingredients into jars. Add the orange zest and juice, Cutting Edge Culture or kefir whey, and cover with water, leaving an inch or two at the top. Seal the container and let it sit on your kitchen counter, out of direct sunlight, for 6 days. After 6 days, place the container in the refrigerator. 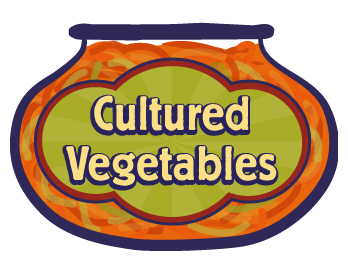 76 Responses to "The Most Powerful Cultured Veggies"
Still new to cultured vegetables but this seams strange. Sliced up an organic head of cabbage in the food processor, put in a large glass bowl, sprinkled with sea salt 2 1/2 Tbls. Really worked it over several times over about an hour. Placed in 2 quart jars and tucked a couple of leaves over the top. All was covered in the juice from the cabbage. 3 days on counter with good CO2 formation. Used the metal lids and bands. Placed in refrigerator for 3 weeks and now there is only a few drops of liquid visible in the jars, still smells ok. Thanks for the recipe.. In making sauerkraut it has to be ferments a lot longer then your recipe states.. I do a large crock & it can take 6 weeks. I don’t use a ‘starter’ , just the natural way. wondering if this is fermented as I am used too..
grow our own cabbage & fruits . I just wanted to ask how much kefir whey to add? I assume it is 1 cup, the same amount of liquid as used with the packaged culture. Is this right? It’s a half a cup in this recipe it’s listed in the ingredients. My cabbage in the orangekraut recipe is turning brown at the top. We keep pushing it down under the juice and in the morning/evening the top layer is brown again. What do you recommend to fix this and also prevent it in the future? Have always thought food was the best medicine. Loving your site. Was just diagnosed with Afib, and “they” have limited my salt intake. I noticed salt is needed for some of the culture foods, very much? Since I’m not eating salt at all right now (except what is naturally in food) I’m thinking a little in your recipe won’t hurt. Opinion? They are usually referring to Common table salt. A small amount of Himalayan Salt is very different and should be ok for you to use. 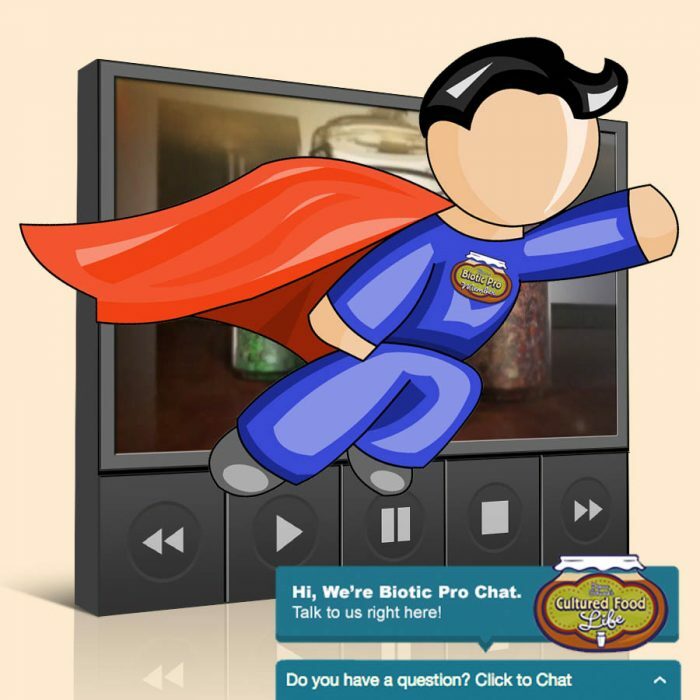 I am loving your website and all fermented goodness. My only question is, what type of cabbage are you recommending with this recipe? I use Realsalt and Himalayan pink salt. Are these ok to use or do I really need the Celtic salt? Crocks for fermenting are stone and not ceramic?? Nope it will be fine no worries. Donna, I have red Hawaiian sea salt, Maldon sea salt or a natural Italian sea salt. Can I use any one of these in place of the Celtic for now? Really looking forward to making these! The combo of these veggies sounds really good. Question: Does it matter if the garlic pressed instead of minced? Donna: I am extremely allergic to garlic and onion. Is it crucial to have these 2 ingredients? Are there enough prebiotics in the rest of ingredients to compensate for the loss of them? Thanks for your wonderful website! Yes, you can leave them out and still get a ton of benefits. Donna, Do I peel the jicama? Also, 1/2 package of the caldwell’s starter seems like such a tiny amount. Do you usually measure or just eyeball it? I just made your wisdom kraut tonight, and am going to make the flu prevention cultured veggies tomorrow night. My first try at fermenting veggies! Yes peel the jicama.I just eyeball it and never measure it ever!It’s just not my thing and bacteria likes room to grow so a small amount goes a long way. Donna if i leave out the apple and orange zest and juice do I just add more water? If so how munch water to replace the juiced orange? I am diabetic and trying to limit the sugar from the fruit. Thanks!! Just add water to cover the veggies. Do you add the ecobloom to the grains and milk, or add after the grains are taken out? You can do either one. is it a must to place the jar in the refrigerator? can i simply leave it on the counter? don’t mind it goes sour. just want to make sure the bacteria count won’t get diminshed. and a question about sauerkraut. no matter how much room i leave at the top of the jar, the brine keep overflowing. the jar usually stays bubbly for at least 10 days but i want the juice so much. what should i do? cannot find airlock from where i live. To preserve the probiotics you need to place it in the fridge because they will diminish. Just remove some and place it in another jar if it over flows and add more water to cover. Hi Donna, is there anything I can use in place of the orange? You can leave it out if you want too or add another apple. And is there a replacement for the orange zest and juice as well – I cannot put anything to do with oranges, due to an allergy. Try an extra apple but it will taste different. Hi, Thanks for the yummy sounding recipe! I just want to be clear. So, I do not mix the orange juice or culture starter mix into the shredded veggies. I first pack all the veggies in the jar first & then pour the liquid over it? It just seems strange to me because usually when I do a shredded veggie ferment I mix all ingredients first & then pack it all in. Also, I have the Body Ecology culture starter which I assume I can use instead of Caldwells? Thanks! Well you can do this but I find that if you add the starter and juice after you put the veggies in the jar all of the starter gets in the veggies and not on the bowl you mixed it in and you will also need to add more water to the jar as well to cover the veggies. Can fermented garlic in honey be used in this recipe? Yes you can use this and it should work well. Will you please expand on the orange, being juiced and zested ? Am I juicing the entire orange, (not using pulp and seeds) and then adding the entire zested orange peel? Thanks. Yes, you are correct. Juicing the orange and adding the zest not the pulp and seeds. What can I replace jicama with in your new recipe? I can’t get jicama here in Australia. Daikon or carrot or leave it out all together but it will taste different. I am unable to get jicama, is there an alternative to that. I see it is from the legume family, could something else be used. Many thanks. Hi. Can you tell me how long kefir whey will keep in the fridge? I have had some for a couple of weeks, and was wondering if it will still have its goodness? It will last many months in the fridge it just gets more sour. Kefir preserves the milk. Hi Donna. I’m a mother on a mission – and I know you understand this! My daughter is suffering from multiple digestive issues and I have been trying to introduce the cultured foods to her. She doesn’t like kefir 🙁 but she does like kombucha, so I have been making that regularly. 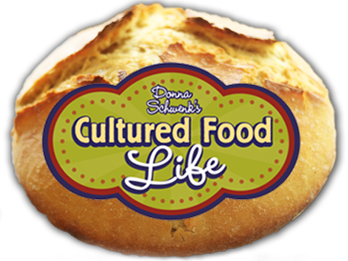 She isn’t interested in the sour kraut or cultured vegetables, but she does love the cultured pickles (Donna’s Dills). 🙂 The problem is that she is experiencing some die-off or whatever you call it – a bad eczema patch on the back of her leg that seems to be getting worse instead of better. It seems like the kombucha and pickles make it flare up all the more. I have been getting her to eat some coconut oil hoping that might attack the yeast (I think this is the underlying problem) and I am very excited about the EcoBloom you mentioned today (I am trying to order it and it isn’t available at the moment – hopefully SOON!). Any other advice would be appreciated. You are a lifeline. Thank you! Eczema can be pretty tricky its a sign of detox and being allergic, and a liver that is over burdened with toxins. 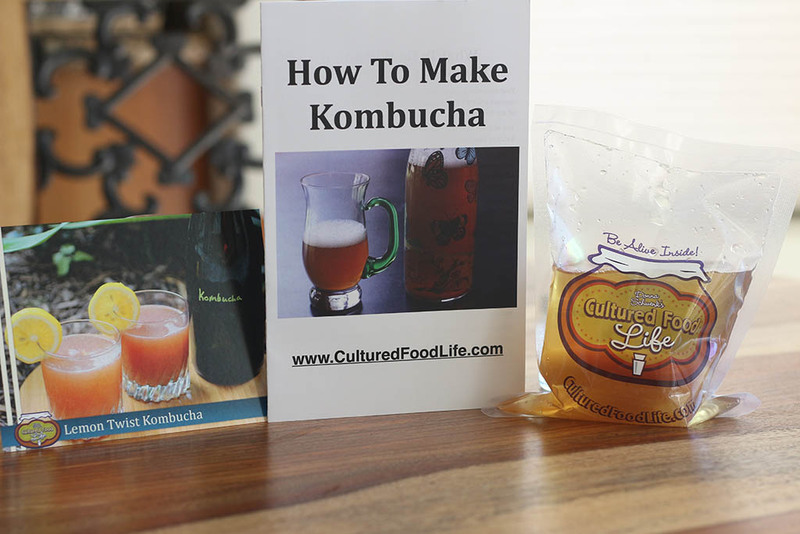 Stick with the coconut oil and try mixing the juice just a spoonful of the cultured veggies in something and lay off the kombucha and see how she does. 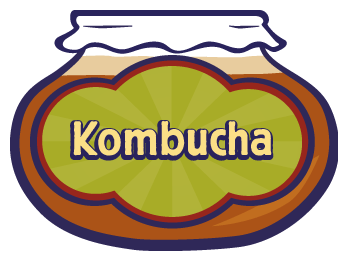 Kombucha works with the liver and will want to detox her fast so it might be good to go really slowly. 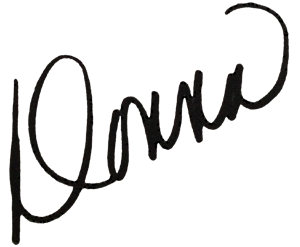 OMG I love this so hard Donna! Fermented prebiotics! What a fabulous idea! Totally making this! Hi. I was just wondering how long will kefir whey will keep in the fridge? I have had some for a couple of weeks and wondered if it keeps its good properties? It last for many months and just gets more sour. Kefir preserves the milk. 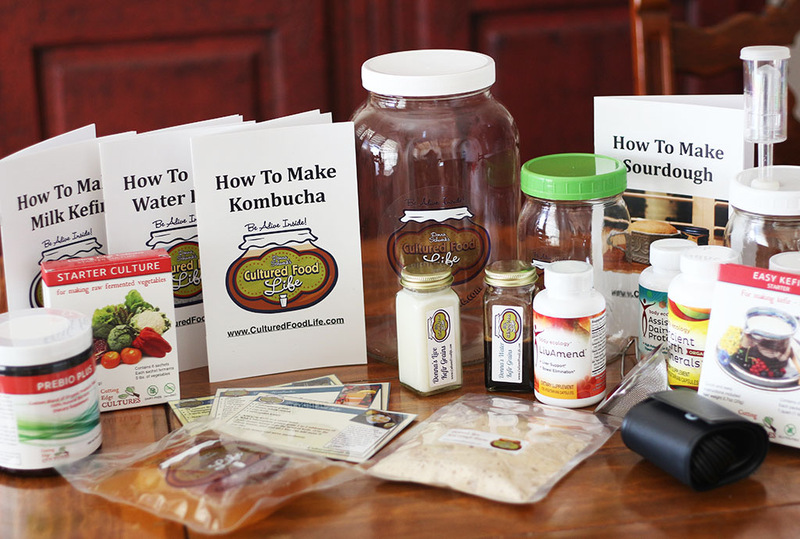 Can I use some water kefir made with unrefined muscadavo sugar? Will it be at all beneficial? Thank you. Too make the veggies with? No this is not as beneficial and is better to just use salt, or the best is a culture. How do you separate off the whey? Mine separates sometimes. Would I just spoon off the kefir? 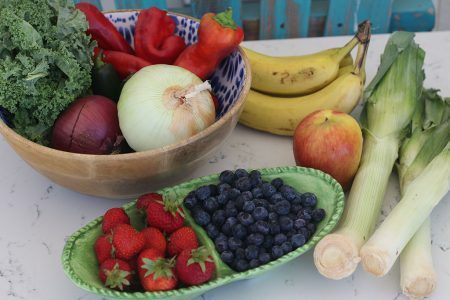 So thrilled to see this blog about prebiotics. This morning I was inspired to make my newest favorite cultured veggies — Horseradish (grated from the root) with leeks (a prebiotic! 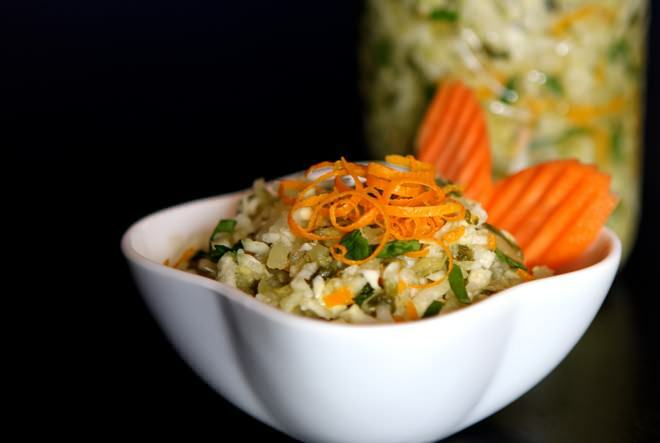 ), carrots and cabbage (red and savoy). Can’t wait til it’s ready to eat! Thank you for all the great information! Just wondering if I can use garlic preserved in honey for this recipe. Thank you so much for all knowledge you share. Can I use the whey drained from yogurt? I made your wisdom kraut with the butternut squash. it turned into soup. Don’t know what I did wrong. So I blended it all together and am drinking about four ounces a day. So what could I have done wrong? Did you add salt this will keep it crunchy and how old was your butternut squash? I am salt restricted. Can the fermented cabbage be made with the starter but without the sodium? Yes if you use a starter you can avoid the salt but the vegetables won’t be crunchy and get mushy over time. Salt keeps them crunchy. I was just reading in a health magazine last week (like Women’s Health, not a natural health magazine) about how to lose weight and keep it off. 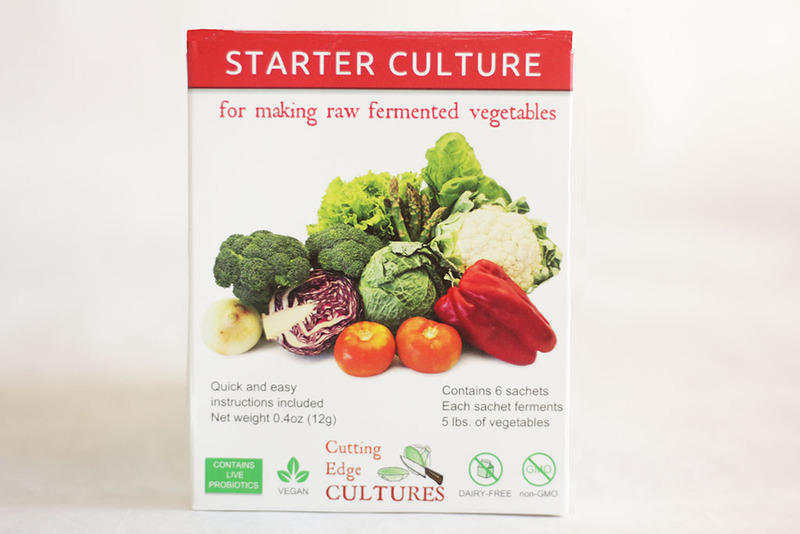 I couldn’t believe that it was fermented foods! Not that I don’t believe that, but that a weight loss and health magazine that usually promotes unhealthy diets and tons of exercise would mention fermented foods. It’s catching on! I can’t wait to try this mixture. My hubby is sick right now with his yearly viral crud. I’ve been eating my Bubby’s and so far I haven’t gotten it. Yeah! I tried making fermented carrots on my own, but they molded. So, I got your vented tops, but haven’t gotten a chance to try again. On my list for this week. Wish me luck. I just was wondering, when you use the actual kefir grains, I only use them for Kefir at the moment, don’t you have to take them out at some stage. I mean out of the cultured vegetables? You don’t eat them do you? 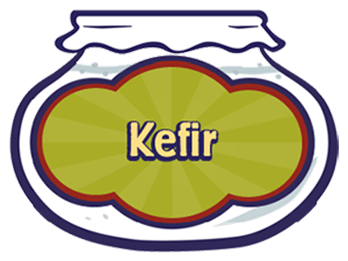 You don’t use kefir grains to make cultured veggies you use the whey from kefir to make cultured veggies. We son’t have jicama here, can I use something else to substitute ? You can add anything else you like, daikon radish, carrots or just leave it out. I just use celtic salt so should I add more when I make this? No the this amount is plenty. Hi Donna, struggling with Candida since June. 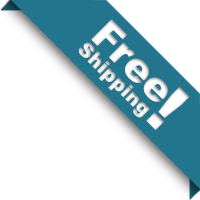 On Candida diet, tons of probiotics, antifungals, coconut oil. I have had some improvements, but if I have, like one smartie, bang, scratchy rashes. It is almost like, I am allergic to sugar? I do not have continuous yeast infection anymore, thanks to tea tree and coconut oil. I like your website and I have already started to make coconut/almond yogurt and it made s huge improvement. I noticed that when I made a red cabbage meal my guts seem to like it, whereas before I had so much has pain. I think you are on to something here by flooding the body with good bacteria. However, I cannot have Dairy and what exactly is Kefir? 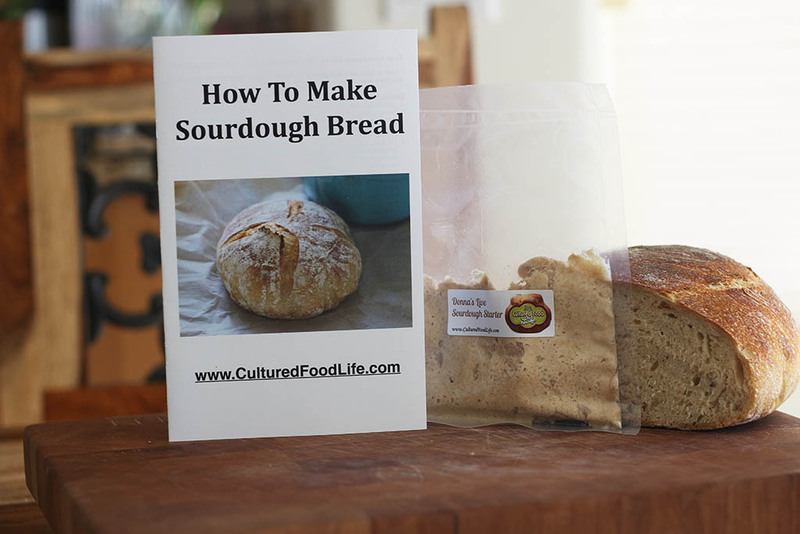 I like sourdough bread but I am not allowed to eat that either, not grain allergy just Candida Diet restrictions. I am interested at this point in fermenting veggies. I am going to attempt to make sauerkraut for the first time. Kombucha is also a major no no, but, I think..may be not. So, what recipe should I try first? If I tried the sourdough starter would it make the yeast worse? So many different opinions, makes me so confused. Thanks for your time. 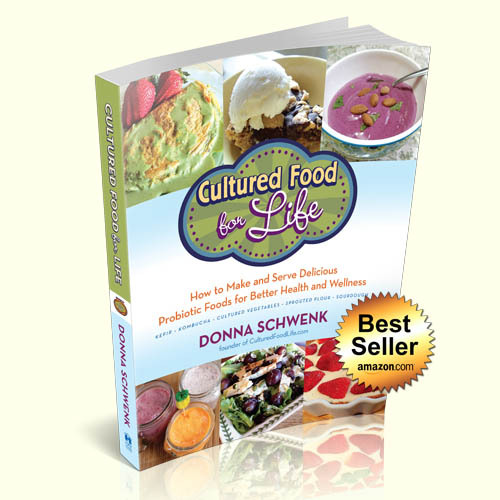 Start with cultured veggies and you can find what you need on my getting started free ebook guide on my site at the top of the page or in my book cultured food for life as everything and recipes as well. 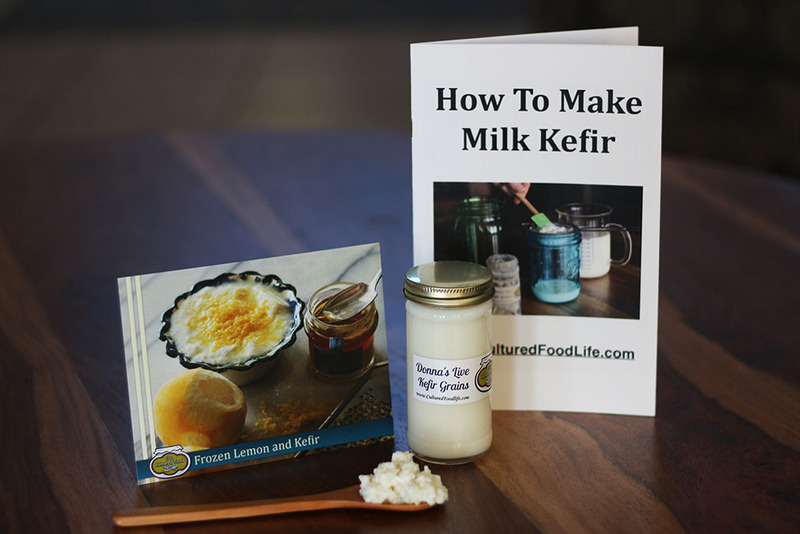 Kefir is stronger than yogurt and you would benefit greatly from this and all the info is on my site and in the two things I mentioned above. Don’t be discouraged the body wants to heal you, just do one thing and go from there and sauerkraut is a great place to start.